It's that time of year: New Year's Eve! Which means I'll be reflecting and talking a bit about how 2017 went for me overall, as a person and an artist. This'll be one of my longer posts to kinda keep you updated on what's been going on. 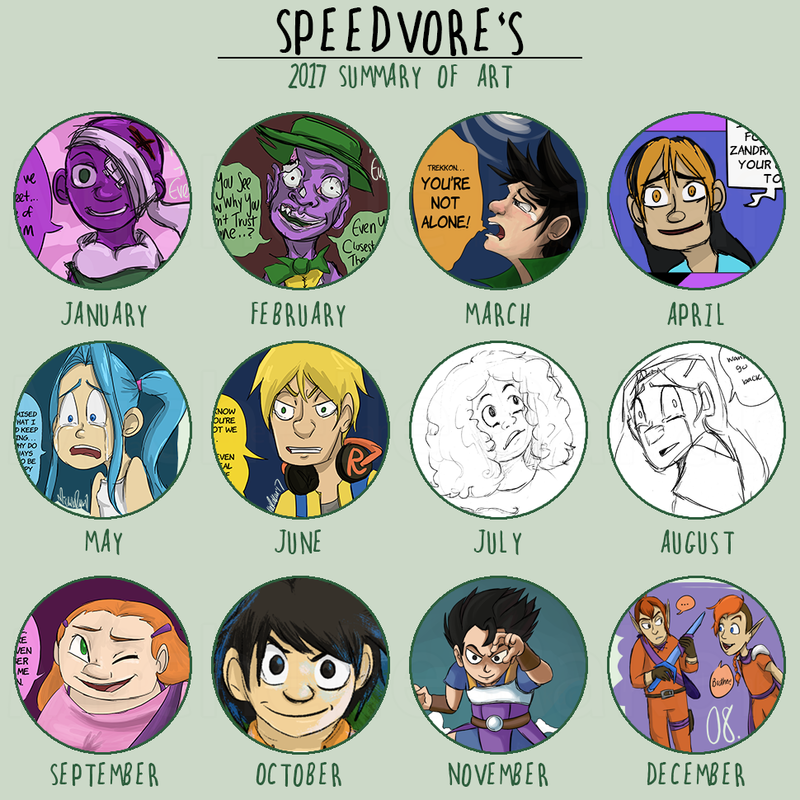 Here is my artwork summary of 2017! The year started out fairly busy with my curriculum work that lasted until May. In the meantime I was able to do some art for myself, including my Eventure Doodles project. I got through almost all of the Eventures that were numbered at the time. Since then, I have been reworking my story a lot and adding in parts earlier on. I created a few documents to keep myself organized, including a document for sorting the Eventures into arcs. That helped me re-order some of the earlier ones and really hone in on which ones fit together best. And all-in-all, we finished 9 Eventures this year! That's a pretty good average and tied with 2012 and 2015. That's technically the third highest number of Eventures per year (since 2011 and 2016 were tied for second with 12). I'm impressed we did so many considering how busy this year has been. So back in the spring, I had the opportunity to participate in two weeks of Spring Break Camp with iD Tech. I met some really great people there and had a lot of fun. Then fast-forwarding to June, I taught at iD Tech's Stanford location: the biggest camp they've got! I was a Lead Instructor, so I had a lot of responsibilities and roles. It was a crazy experience, but I'm glad I did it. I learned a lot and was able to set some new goals for myself based on the experience. After the summer, I flew to Kentucky to hang out with my friend Jinny for a week. It was great to have this vacation after the busy summer. And then after that vacation, I went on vacation part two where I went to Las Vegas with a group of co-workers and friends from iD Tech. It was the first time I had gone since I was a baby, so it was a lot of fun to see. So much good food and company! Then I finally got back into working on personal projects full-time when September came around. I worked on personal projects for a few months and was able to accomplish a lot. I also worked a lot on the game I've been working on with my friends for about a year or so now. I finished a lot of re-writing and proofreading that needed to be done. We're still not sure when we'll be ready to post new information about that, but I'll definitely be posting here when it's time for that. We're doing a lot of re-working to make sure that it's up to the quality level we hope to obtain. This is slowing down our progress a bit, but it'll be worth it in the end. And as usual, I participated in Inktober, Huevember, and Digicember this year. Inktober was a weird experiment where I designed new characters not for my main story. It was fun at first, but I started to run out of ideas towards the end. Huevember was a mixture of Huevember and NaNoWriMo, so it was also a fun experiment. I started spending a lot of time on them though, so I wanted to try out sketching more often. And that's when Digicember happened where I decided to be a lot looser with my work and it was the most successful of the three. In December, I started my job back up with iD Tech, writing curriculum. This time around I'm also writing the new GameMaker curriculum, so that's been fun working in so far. Since I only started a week before the holiday break, I haven't worked a whole lot yet, but I'm excited to continue working once we get back from the holiday break! Overall 2017 was an interesting year. I think I did a lot better in my personal life, so that was a nice break from some things that happened in 2016. I'll talk about some plans for 2018 in my next post, but overall I'm hoping to squeeze in more time for personal projects on days that I'm working so I can keep on practicing. 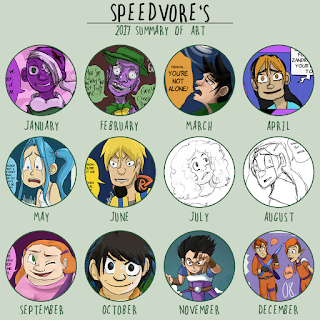 2017 was probably my busiest year so far, so that's why I might've updated a bit less, but we'll see what 2018 brings!